Q: Can I pour my own floor? A: No. The USG Levelrock supplier makes it a requirement that an individual is a licensed applicator to purchase products used in the pouring of your floor. This assures a quality floor when the project is completed. Q: Can I pour gypsum concrete in my garage so I can have a heated floor? A: No. Gypsum concrete is considered a subfloor. That means you must cover it with a finished flooring product such as wood, carpet or tile. In a newly constructed garage, you can pour a concrete slab over heat tubes for a radiant floor system. Q: Does it matter if the floor freezes after you pour it? A: The building needs to be heated to a minimum of 50 degrees prior to pouring, and maintained at that temperature until cured. Freezing inhibits the gypsum crystals from bonding. This will cause a weak floor that may crumble, peel, or delaminate.  Q: How long does the floor slab take to cure? A: Cure time is dependant on several different factors. You must provide ventilation to remove the moisture as rapidly as possible. The applicator will leave windows and doors open 3-4 inches and ask you to turn fans on. Unlike Portland based concrete slabs which like a slow cure, Gypsum based concrete slabs require quick hydration to achieve their highest P.S.I. Q: I don't know if my house can hold the weight of gypsum concrete. How much does it weigh? A: USG's Levelrock products weigh 14.7 pounds per square foot, poured 1.5" thick. You need to check with your architect or builder to assure that your subfloor is designed to support loads with maximum L/360 deflection ratio. Q: Can I use gypsum concrete floors as finished flooring? A: Yes. USG offers the product Ultra-Armor that can be polished as a finished floor. Q: What do I need to do to schedule my job with you? Your building must be completely dried in. In winter you also need to have the insulation in and provide heat to keep the inside temperature 50 degrees. Soft scheduling should be begin 1-2 months ahead of time. Once we get within two weeks of the soft schedule date, we need to have a hard date. Normally, in multi-family and commercial, wood-framed construction, installation should be scheduled after drywall and taping are completed. This helps to prevent excessive traffic which could result in floor damage. This is usually not the case when installing LEVELROCK for a radiant slab. When installing for radiant we typically come in before drywall and right after the radiant tubes are installed. This minimizes the possibility of puncturing the radiant tubing. Any flooring and nailing inspections must be completed prior to installation of gypsum concrete. Subfloor must be determined as structurally sound (Minimum of L/360). Q: What do I need to do to be ready for you to pour my floor? Provide 12 gallons per minute of water using a faucet with a minimum 3/4" internal diameter. Have floors to be worked on, free of other trades for the day. Provide a clear set-up area (approximately 50x100 feet) as close to the building as possible in a central location. This area should have free and clear access to the inside of the building. For safety concerns we prefer to bring our discharge hose up interior stairs, as opposed to going straight up thru a window opening. A dumpster or designated area for disposal of empty material bags. Subfloor must be broom clean and free of debris, equipment, mud, oil, wood chips and any other contaminants. All cracks, voids, and holes in the subfloors must be covered or plugged. Permanent wood stops should be placed around top of stairs, and any open to below areas, at desired thickness. No other stops or plates should be in as the floor is continuous. Any bottom plates that go through doorways should be removed. Areas where we are not to pour should be blocked off and marked as DO NOT POUR. The water closet rings should be set at the desired height. If gypsum underlayment is specified under the bathtubs, bathtubs must be on permanent blocks allowing access for pouring under the tubs. Plumbing chases should be sealed if gypsum is to be poured under the bathtubs. Floor ducts should be surrounded with permanent stops or sealed with caulking. All electrical floor outlets must be boxed in. The minimum thickness over heat pipes or electrical conduit should be 3/4". Building must be maintained at a temperature of 50 degrees before, during and after installation of the floor until the floor is moisture free. We think that it is very beneficial to have your boiler installed & turned on the day of the pour. We can pour over the hot pipes (90 - 115 degrees water temperature) without affecting the set time of the gypsum pour. This by itself will expediate the drying/curing process. Q: How long will it be after you pour the floor before we can walk on it? A: The floor is set-up enough to walk on in approximately 90 minutes and should be ready the day after the pour for your other subcontractors to return to work. Q: How long does it take to pour the floor? A: Set-up, and clean-up can frequently take longer than the actual pour itself. A floor area of 2500 sq ft poured 1 1/2" thick takes approximately 2 hours to pour. We can pour 15,000 sq.ft. in a long day at 1.5" thick. Q: What do I need to do after the floor is poured? After the pour, maintain a 50 degree temperature and adequate ventilation to dry floor. Approximately 7 to 14 days are required for complete curing, depending on climatic conditions. Place temporary wood planking or plywood in areas subject to heavy wheeled traffic or concentrated loads [ i.e. rolling scaffold, sheetrock dollies]. Do not install floor coverings until gypsum floors are totally cured. The flooring subcontractor should be responsible for testing for dryness before installation of finished floor goods.